I haven't posted in a while, since I ended up with food poisoning last weekend. I couldn't eat much at all, never mind try a new recipe. I made another big batch of my Slow Cooker Roasted Red Pepper & Goat Cheese soup a few weeks ago and it went over well, so I thought similar flavours would make a great sauce for chicken. I used chicken thighs, but you could swap them for boneless skinless chicken breasts. The chicken and sauce can be served over brown rice or whole wheat pasta. 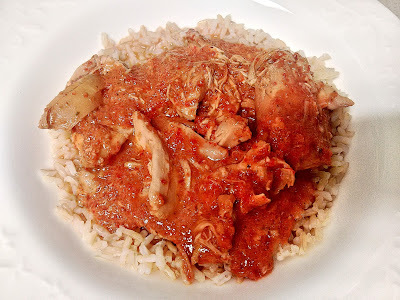 Place chicken in the bottom of the slow cooker pot. Combine all remaining ingredients (except goat cheese) in a food processor and blend until smooth. Pour over chicken and cook on low for 8 hours. When 8 hours is complete, remove lid and add goat cheese to slow cooker pot. Stir to combine and allow goat cheese to melt into the sauce.